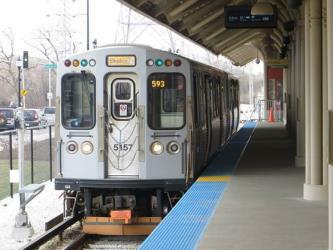 What is the cheapest way to get from Chicago O'Hare Airport (ORD) to Chicago Loop? The cheapest way to get from Chicago O'Hare Airport (ORD) to Chicago Loop is to drive which costs $1 - $3 and takes 20m. 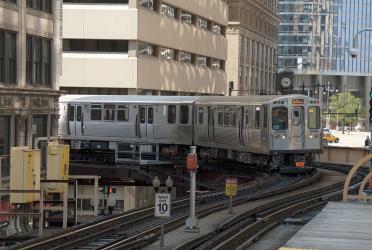 What is the fastest way to get from Chicago O'Hare Airport (ORD) to Chicago Loop? The quickest way to get from Chicago O'Hare Airport (ORD) to Chicago Loop is to taxi which costs $55 - $70 and takes 20m. Is there a direct bus between Chicago O'Hare Airport (ORD) and Chicago Loop? Yes, there is a direct bus departing from Terminal 2, Chicago, IL - O'Hare Intl Airport and arriving at Union Station, Jackson & Canal station. Services depart once daily, and operate every day. The journey takes approximately 1h. How far is it from Chicago O'Hare Airport (ORD) to Chicago Loop? The distance between Chicago O'Hare Airport (ORD) and Chicago Loop is 15 miles. The road distance is 18 miles. 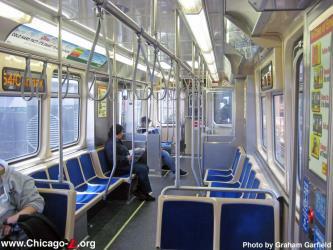 How do I travel from Chicago O'Hare Airport (ORD) to Chicago Loop without a car? The best way to get from Chicago O'Hare Airport (ORD) to Chicago Loop without a car is to subway which takes 41m and costs $2 - $5. How long does it take to get from Chicago O'Hare Airport (ORD) to Chicago Loop? 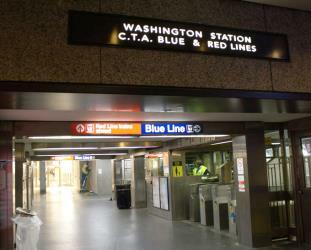 The subway from O'Hare to Clark/Lake takes 41m including transfers and departs every 10 minutes. Where do I catch the Chicago O'Hare Airport (ORD) to Chicago Loop bus from? Chicago O'Hare Airport (ORD) to Chicago Loop bus services, operated by Peoria Charter Coach Company, depart from Terminal 2, Chicago, IL - O'Hare Intl Airport station. Where does the Chicago O'Hare Airport (ORD) to Chicago Loop bus arrive? Chicago O'Hare Airport (ORD) to Chicago Loop bus services, operated by Peoria Charter Coach Company, arrive at Union Station, Jackson & Canal. Can I drive from Chicago O'Hare Airport (ORD) to Chicago Loop? Yes, the driving distance between Chicago O'Hare Airport (ORD) to Chicago Loop is 18 miles. It takes approximately 20m to drive from Chicago O'Hare Airport (ORD) to Chicago Loop. Where can I stay near Chicago Loop? There are 917+ hotels available in Chicago Loop. Prices start at $93 USD per night. What companies run services between Chicago O'Hare Airport (ORD), USA and Chicago Loop, IL, USA? Peoria Charter Coach Company operates a bus from Chicago O'Hare Airport (ORD) to Chicago Loop once daily. Tickets cost $13 - $16 and the journey takes 1h. Rome2rio's Travel Guide series provide vital information for the global traveller. Read our range of informative guides on popular transport routes and companies - including Getting to Rome from the airport, What documents do I need to cross Niagara Falls? and How to get from Stansted Airport into central London - to help you get the most out of your next trip. Millennium Park is a public park located in the Loop community area of Chicago in Illinois, US, and originally intended to celebrate the third millennium. It is a prominent civic center near the city's Lake Michigan shoreline that covers a 24.5 acre section of northwestern Grant Park. The area was previously occupied by parkland, Illinois Central rail yards, and parking lots. The park, which is bounded by Michigan Avenue, Randolph Street, Columbus Drive and East Monroe Drive, features a variety of public art. As of 2009, Millennium Park trailed only Navy Pier as a Chicago tourist attraction and by 2017 it had become the number one tourist attraction in the Midwestern United States. In 2015, the park became the location of the city's annual Christmas tree lighting. The Art Institute of Chicago, founded in 1879 and located in Chicago's Grant Park, is one of the oldest and largest art museums in the United States. Recognized for its curatorial efforts and popularity among visitors, the museum hosts approximately 1.5 million guests annually. Its collection—stewarded by 11 curatorial departments—is encyclopedic, and includes iconic works such as Georges Seurat's A Sunday on La Grande Jatte — 1884, Pablo Picasso's The Old Guitarist, Edward Hopper's Nighthawks, and Grant Wood's American Gothic. Its permanent collection of nearly 300,000 works of art is augmented by more than 30 special exhibitions mounted yearly that illuminate aspects of the collection and present cutting-edge curatorial and scientific research. Cloud Gate is a public sculpture by Indian-born British artist Sir Anish Kapoor, that is the centerpiece of AT&T Plaza at Millennium Park in the Loop community area of Chicago, Illinois. The sculpture and AT&T Plaza are located on top of Park Grill, between the Chase Promenade and McCormick Tribune Plaza & Ice Rink. Constructed between 2004 and 2006, the sculpture is nicknamed The Bean because of its shape. Made up of 168 stainless steel plates welded together, its highly polished exterior has no visible seams. It measures 33 by, and weighs 110 ST. The Willis Tower, built as and still commonly referred to as the Sears Tower, is a 110-story, 442.1 m skyscraper in Chicago, Illinois, United States. At completion in 1973, it surpassed the World Trade Center towers in New York to become the tallest building in the world, a title it held for nearly 25 years and remained the tallest building in the Western Hemisphere until 2014 and the completion of a new building at the World Trade Center site. The building is considered a seminal achievement for its architect Fazlur Rahman Khan. The Willis Tower is the second-tallest building in the United States and the 16th-tallest in the world. More than one million people visit its observation deck each year, making it one of Chicago's most popular tourist destinations. The structure was renamed in 2009 by the Willis Group as part of its lease on a portion of the tower's space. Rome2rio makes travelling from Chicago O'Hare Airport (ORD) to Chicago Loop easy. Rome2rio is a door-to-door travel information and booking engine, helping you get to and from any location in the world. 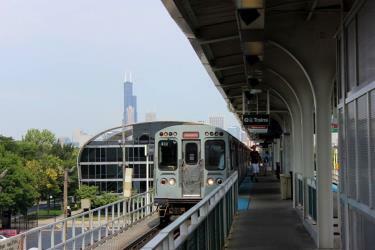 Find all the transport options for your trip from Chicago O'Hare Airport (ORD) to Chicago Loop right here. Rome2rio displays up to date schedules, route maps, journey times and estimated fares from relevant transport operators, ensuring you can make an informed decision about which option will suit you best. Rome2rio also offers online bookings for selected operators, making reservations easy and straightforward.